A few hours spent at a neighboring table at an open house set the course for meeting this amazing couple. My videographer and I had plenty of time for wonderful conversation with the table beside us who just happened to be Petals By Design. Don't know them? Check em out, they do AMAZING floral arrangements and are a wonderful group of people as well! Laura happened to mention that her daughter was getting married later this year and and that she would pass my information along to her. I happily passed a card along and we all went our own ways after the eventful day. Only a few weeks later I received an email from her daughter, Alyssa, and after only a few exchanges and conversations we were booked for her big day. So Alyssa; I have to give a huge THANK YOU to your mom for the recommendation! Yesterday was the first time I actual met Alyssa & Tyler and it was the day of our first session together. 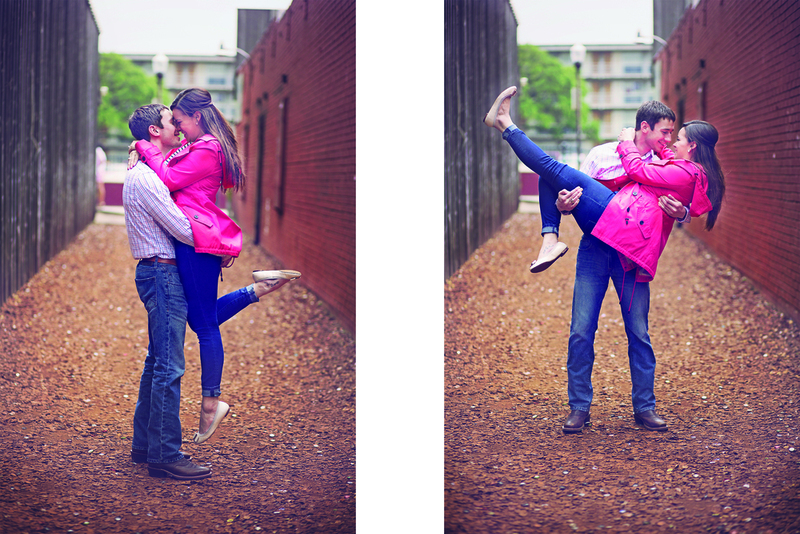 They are both Texas A&M grads and really wanted the session to be at the place they met....who am I to argue with that? With a huge chance of rain and a lot of time in the day we met and had all the preparations complete for the rain, if it did indeed come (and we were secretly hoping for it as well). Alyssa & Tyler are simply one awesome couple. They are all smiles together, comfortable, relaxed and truly a pleasure to work with. I can not wait for the wedding day later this year! We began at, where else, the Century Tree of course and neither of them had ever walked under it...If you know the legends then you know why. So this was the first time for them to be together beneath the tree and they didn't stop there; they even climbed on up for a bit as well! The mid-day sun did chase us for a while and at the very last location we did get the rain that we were hoping for and in the perfect, non-soaking amount as well. Below are just a few samples from the day I spent with them and there will be many more to show as time goes by! I hope they are enjoyed by all and can't wait to meet the rest of the family and friends!